Georgia's Home Inspirations: Bring the Cornfield to Your Door! Beautiful wreath made by A.J. Ackleson for Georgia's! While meandering through Ohio this weekend, I passed through a quaint little town where the streets were lined with homes decked out in Fall finery. There were pumpkins, gourds, haystacks, cornstalks, scarecrows...it was really charming. But one house in particular caught my eye! This was a "stop the car!" moment for me. I just loved this wreath! The size and free form of the corn husks really appealed to me. I had to have one. I knocked on the door, but there was no answer. As I was leaving, the lady of the house walked up the sidewalk and I asked her about it. She said that she had gotten it at an antique market and that she, too, loved it's size and style. Over the next three hours of driving, as I passed cornfield after cornfield, I decided I would buy some cornstalks and try to make one. Here is what I came up with for under $20 and, if I do say so myself, it turned out great! 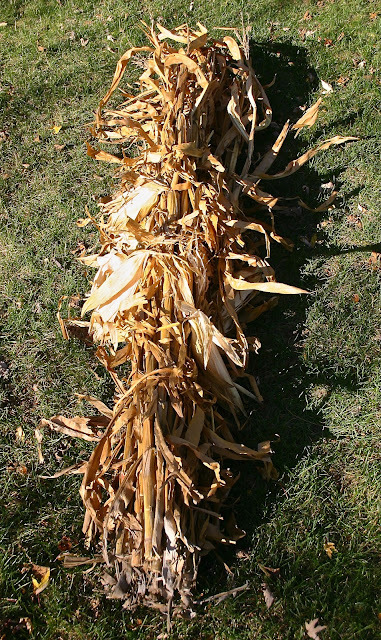 You need three bundles of cornstalks for this project in order to have a good selection of leafy parts. 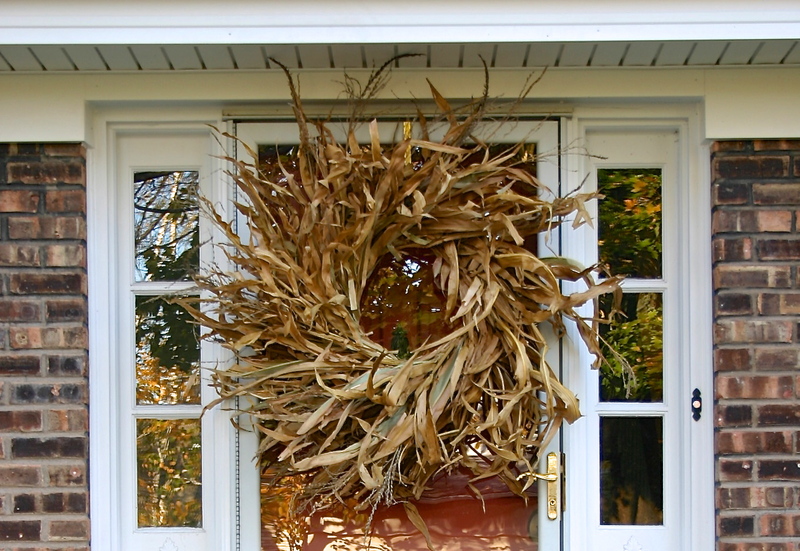 Gather supplies: straw wreath form, twine or wire, clippers, scissors, florist greening pins and wreath hanger. Start by determining the approximate diameter you want the finished wreath to be. This is important to know in order to determine the length of the cornstalk pieces to cut. Then, using your clippers, cut the top leafy parts of 4 to 5 stalks and tie them on the wreath form. Continue to cut and bundle cornstalk sections attaching each bundle by wrapping tightly with twine and forming a clove hitch knot (or a knot of your choice) before adding the next bundle. To add fluff to each bundle, pull off individual husks from the base of the stalk and add them to the 4 or 5 stalk tops. The wreath is starting to take shape. Beware, it gets big! The finished product! It definitely makes a statement don't you think? A little something for the squirrels!